Although precast concrete is quite heavy, nearly all other competing materials require machinery for handling and installation as well. Speed of installation is more dependent on excavation than product handling and placement. Precast’s superior strength means that installation is often easier, quicker and less costly. It also requires less ongoing maintenance and a reduced likelihood of future problems. That means a lower total cost over the life cycle of a project. Studies have shown that precast concrete products can provide a service life in excess of 100 years. 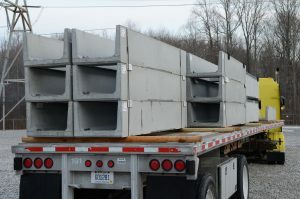 For severe service conditions, additional design options are available which can extend the life of the precast concrete product. This is extremely important when calculating life cycle costs for a project. Precast concrete also resists most substances. While no material is completely immune to attack from aggressive chemical agents, precast products can often be designed to resist corrosion in specific applications. Because precast concrete products typically are produced in a controlled environment, they exhibit high quality and uniformity. Variables typically affecting quality on a job site – temperature, humidity, craftsmanship – are closely controlled in a plant environment.